Bunnies by the Bay - such a darling collection of toys and clothing for your sweet baby. Come in for a lovely gift for the mother to be or to welcome the new baby to the world with one of our sweet plush animals to keep them company as they sleep in their crib. 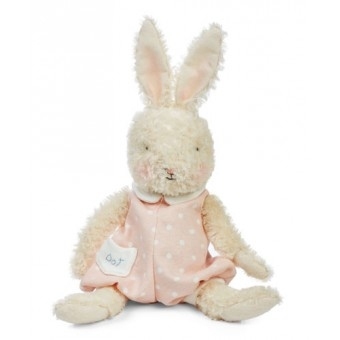 Dot is an adorable bunny with distressed cream colored fur and felt pads with lined ears. She wears a rosebud pink and cream jumpsuit with polka dots and felt buttons. Her name is embroidered on her pocket. 12" and can be spot cleaned. Copyright © 2012 - 2019 Gingerbreads Teas and Treasures. All rights reserved.